Being a photographer is a double edged sword. Yes, I can make my pictures look very pretty, but it's a lot of work and I get incredibly annoyed/enraged/depressed when the pictures aren't perfect. So I talk myself out of posting house pics A LOT. Also, I am sick as a dog, Ike has been home sick all week, and I have a doctor's appt today, so computer usage has been at an all time low (sadly I have yet to figure out how to write a post on my phone). What I'm trying to say is, I'm sorry I'm such a crap blogger. I have great hopes of being better in the near future. But the future is later so in the meantime, look at these random pictures and let me tell you about my adventures. Yesterday I braved all manner of hideous setbacks to buy a Maitland Smith tessellated coral cocktail table set, just like the one you see in this here 1st Dibs picture. I got the coffee table and a pair of end tables for $175. BAM. Or I could have paid $3750 for just the table from 1st Dibs (WHERE do these prices come from?!). 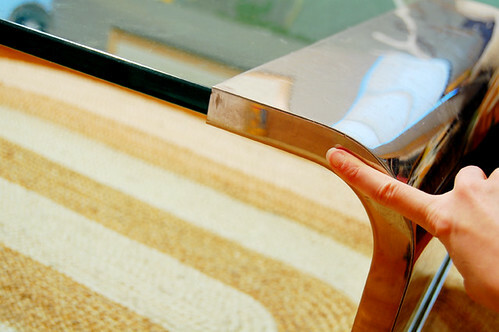 The end tables look great, but the coffee table has a few etched in rings and a dull surface. Anyone know how to polish those out and reseal the top? I'm guessing whatever would work on marble or travertine would work on this. It's a really cool table, but I really wanted something square for our new seating arrangement. I'm about to put it on Craigs, but if anyone wants to buy it shoot me an email or leave a comment. It does have some dings and scratches, and is generally... well loved. But it's still built to withstand the apocalypse, so local buyers only. It's easily the heaviest thing I own. It's by Little Greene wallpaper; the pattern is pines. Here's a closer look at the colorway I have taped up right now. It's teal with subtle golden pine needles. So has anyone ever hung Little Greene wallpaper? I'm starting to freak about hanging real wallpaper by myself... you have to book and soak it. I'm not even sure it's pre trimmed. Scary thoughts. Deep breaths. Ok, that's all my news for today. Please tell me how to fix my life, or at least how to hang wallpaper and polish my new table.